Money in particular is the subject of much theory and deliberation regarding happiness. Yet we only have to pick up any celebrity magazine or read about financially wealthy people to see they are no more happy than most of us. Having coached both millionaires and people in financial poverty, it’s plainly obvious to me that there is no correlation between money and happiness. Money in and of itself cannot bring any feeling, just like anything outside of us cannot help us feel anything. But it is a great tool for exchanging value of service and therefore opening up avenues of more options. 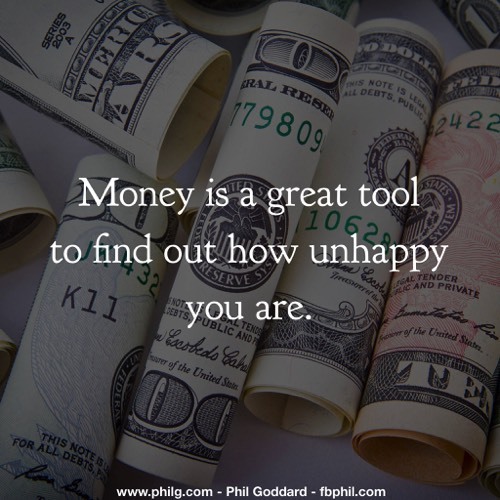 So if you are predominantly unhappy, money will help you explore more ways to discover and show that. And yes, it can help you invest in exploring ways to discover how to reconnect with your innate happiness. Perhaps it's most worthwhile use. But it’s never the money that brings happiness, it only enables you to explore more options to discover the truth about happiness. Money is a great tool. That’s all. A very useful one, and one I LOVE to use abundantly and often. But just a tool, all the same.